Donald Trump said the new trade deal struck with Canada and Mexico was "the most important" ever agreed by the US. 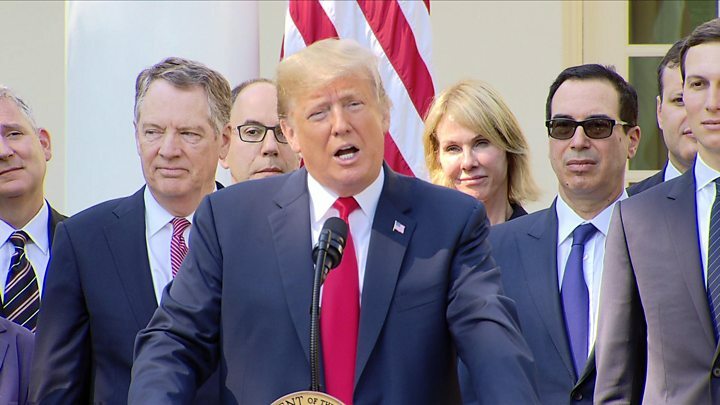 The president said the United States-Mexico-Canada Agreement (USMCA), which replaces Nafta, would bring thousands of jobs back to North America. Speaking at the White House, Mr Trump said the new pact vindicated his threats over trade tariffs. The new deal covered trade between the three countries worth $1.2trn and was "truly historic", he said. It was also "the biggest trade deal in the United States history", he told a press conference. Who gets what from new Nafta deal? He said the new deal was "much more reciprocal" than Nafta, which he described as "perhaps the worst trade deal ever made". The measures in the new deal - which Mr Trump dubbed "US MCA" - "will support many - hundreds of thousands - American jobs". "Without tariffs we wouldn't be talking about a deal," Mr Trump said. "We had to make compromises, and some were more difficult than others," he said. "We never believed that it would be easy, and it wasn't, but today is a good day for Canada." However, Mr Trump said it was too soon to talk to China, on which the US has imposed three rounds of tariffs this year, about a trade deal. "China wants to talk, very badly ... [we] can't talk now because they're not ready," Mr Trump said. Other trading partners had been tough on the US, he said, including the European Union, which introduced retaliatory tariffs on US goods in June. The president said he was having a "successful negotiation" with the EU. He said it was "privilege" for other countries to trade with the US: "So we have negotiated this new agreement [with Mexico and Canada] based on the principle of fairness and reciprocity - to me it's the most important world in trade, because we've been treated so unfairly by so many nations all over the world." The new deal was "terrific" for all three countries, he added. Hundreds of pages of the agreement released early on Monday contain updated arrangements for Canada's dairy industry and measures aimed at shifting lower-paid car manufacturing jobs from Mexico. US farmers will gain access to 3.5% of Canada's dairy market worth $16bn a year, while another requirement stipulates that 40% of components for vehicles produced in the USMCA area must be made in areas paying wages of $16 an hour. Meredith Crowley, international trade economist at the University of Cambridge, said the agreement on dairy appeared be a "cosmetic concession", suggesting Canada had done well out of the pact. She said the insertion of a minimum wage level for car parts workers could lead to similar clauses in other trade deals: "If it turns out to be very politically popular in the US it could [be used again]." Mr Trump said the deal was a victory for farmers, car workers and the US manufacturing industry: "It means far more American jobs, and these are high-quality jobs." USMCA trade deal: Who gets what from 'new Nafta'?